Imagine being able to travel between worlds. April Ryan is one of those who can, a shifter. In the year 2209 the balance between Stark (Earth) and the magical world Arcadia has been restored by her deeds and has never been seen on Stark anymore since then. Ten years later Zoe Castillo gets haunted by nightmares of a little girl telling her to save April Ryan. The balance seems to be disturbed once again and this time it's Zoe's turn to set things right. The Longest Journey was one of the best adventure games in 1999, and got reviewed by our fellow friend Hollow, receiving a 9/10. 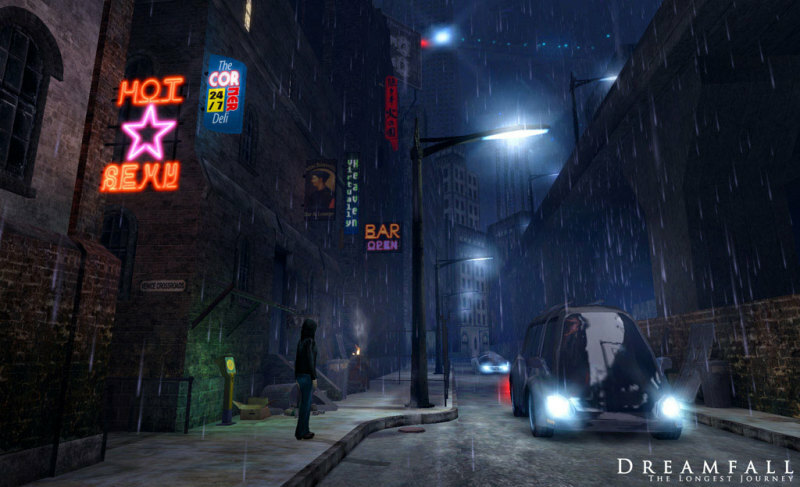 Dreamfall is part two in what seems to be a trilogy. While the first episode resembled a traditional point and click adventure, the second installment actually adds and changes a few things to extend the experience. 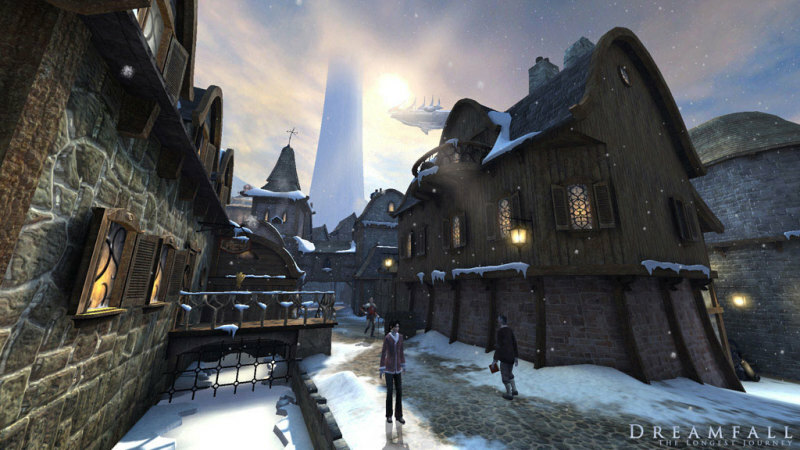 Just like Dreamfall's predecessor you will mostly explore, solve puzzles and interact with NPCs and various objects in the game. Most of the time you play as Zoe, but throughout the game you will encounter two more characters you can direct, April Ryan and the warrior Kian. [--- Give me a hand. You can either use mouse, keyboard, or gamepad to control the current character. There is a new feature to look around the scene which is only available by right-clicking and moving around with the mouse, but apart from that the game can be played completely on the keyboard alone. Plus, except in fighting mode, you can play it with only one hand which is pretty convenient - unlike other 3D action/exploration games that require both human grabbing instruments. 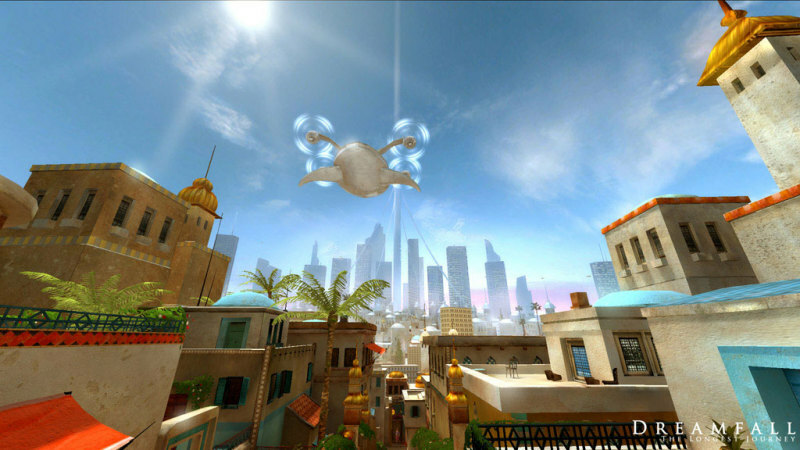 Fighting has been implemented to squeeze some action between the exploration and puzzle solving parts. It takes a bit to get used to the fighting system, but once you find out that dodging is everything you will win most fights with ease - and probably wonder why it was implemented at all. There is a serious lack of AI, which allows you to sometimes simply smash one button repeatedly until your opponent dies. As usual, the inventory lets you examine, use or combine items. You don't get a lot of items in Dreamfall, most of the time your versatile mobile and a lock pick are the only items in your pockets. Using your mobile and some software that is installed on it you can hack into objects through a simple mini game, in which you have to search for various symbols on a field in limited time. As for lock picking, it's required to solve a mini game that is a bit similar to the game Slotter/Downfall by MB. There is also a bit of stealth gameplay poored into the genre soup: You have to sneak behind guards and knock them out, or carefully walk around a sleeping dog. Objects and characters in the world are highlighted and can be interacted with by simply hitting Space (if you're playing with keyboard). As for objects, unlike Point and Click Adventures which mostly require you to observe the screen pixel by pixel, the marked objects somewhat make puzzles seem a lot less difficult. 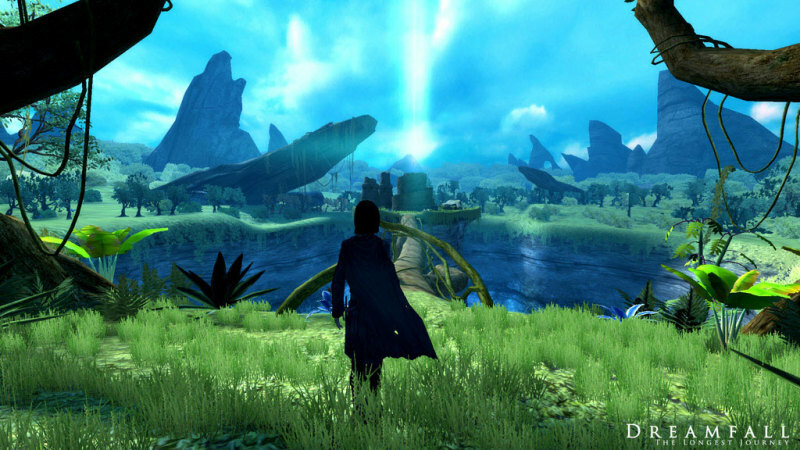 Funcom utilizes the Shark 3D engine to build the richly detailed environments of Dreamfall. Be it the futuristic Casablanca in the year 2219 on Stark, or the magical world Arcadia - the strong artistic design will make you believe you are there. With such an incredible detail you'd think the requirements would just sky-rocket and not even PCs of the current generation would be able to view Dreamfall as intended, but that is not the case here. Actually I played Dreamfall on a 950Mhz machine, and where HalfLife 2 would already bite the dust (if it would even run), Dreamfall kept on breathing, with bump mapping, weather effects, reflections and all that jazz. Even though environments and models are stunning, the character models' running animations seem to be a bit stiff, and in dialogues the faces could have used a bit more emotions and variations. But when running around with April Ryan, the main character of the first game, and seeing her cape actually moving around realistically while walking, the little flaws are simply erased from your memory. While the dialogues slightly lack in facial emotions and animations, the voice actors make up for it. Sometimes in Dreamfall you are exposed to huge piles of story exposition by speaking to various characters or watching ingame sequences, and if it weren't for the great cast you wouldn't be able to stand the often more than ten to twenty minutes long discussions. As it is, the story grasps your attention and doesn't let you rest until the end of the game. As for the music, right when you fire up Dreamfall you're presented to the splash screen and the intro music which immediately sets the bar of what to expect of the rest of the game very high. I really suggest you play the game using WASD. When I first played the game the mouse controls felt awkward. If you play keyboard only the control over the character feels a bit more precise - but that's a matter of taste, I presume. 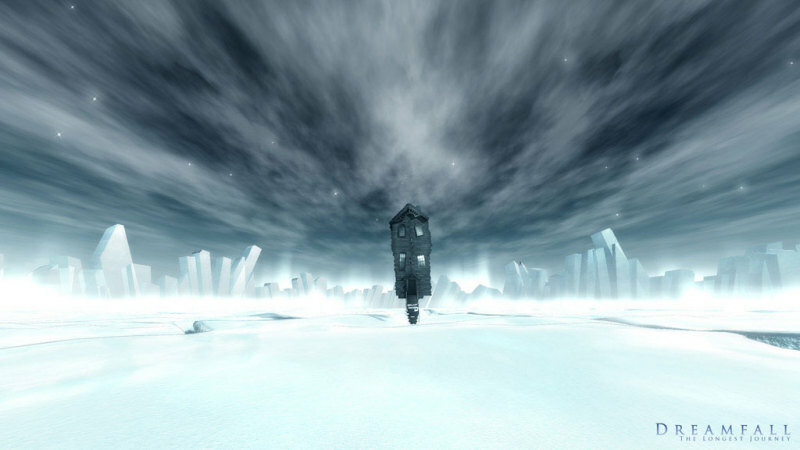 After I had learned my way around and taken my first steps outside in the huge future world, I simply was amazed by the authenticity of the surroundings and the superb voice acting. But what really set this game apart from everything else was the story, which indeed does leave open a lot of questions that will (hopefully) be answered in the third game. At one particular point two of the three characters you take control of throughout the game face each other in a dialogue and you are kind of talking to yourself because the camera keeps moving behind the two characters to show different responses for you to pick. That was one of the many scenes that made the game as outstanding and mind-blowing as it is. In total, you won't regret following my recommendation to play this masterpiece.